Ally Gilchrist has been in top form for Derry City this season. The 24 year-old defender made his Derry City debut against his former club in the 2-0 defeat at Tallaght Stadium on February 22nd on a night when the Candy Stripes produced a below-par performance. The teams re-engage in battle at the Ryan McBride Brandywell Stadium under very different circumstances on Good Friday with Derry in second spot in the league behind Rovers who have an eight point advantage on the summit. 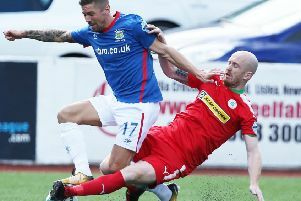 Gilchrist, who spent last season with Stephen Bradley's charges having signed from St Johnstone, believes Friday's match will be much more competitive with Derry going into the game in top form. Rovers go into the game off the back of an eight game unbeaten run in the league while the Candy Stripes boast a five match winning streak in all competitions. The RTE televised clash promises to be an entertaining encounter and Gilchrist believes it's a match Derry must show they are capable of winning if they are to entertain talk of challenging at the top end of the league. "We didn't give the best account of ourselves down there," admitted Gilchrist. "That's probably the one game this season where we can look back on and say we didn't do enough. "So we need to right our wrongs and show the fans we can go and do it. We want to compete at the top so we need to win games like this. "I came back to this league because I felt I didn't get a good crack at it. I felt I needed to show people I am a good player. "There's no hard feelings with Shamrock Rovers. I've got a lot of mates there but it's all business on Friday night so hopefully we can push on and get the three points. "Hopefully it is packed. They're coming into our patch and we're confident playing on our pitch, we train on it every day. So I'm definitely looking forward to it and I'm sure the rest of the boys are too." Wins over Sligo Rovers (2-0), Finn Harps (3-2), UCD (2-0) and St Patrick's Athletic has left Derry in a promising position in second place. Eight points separate them from the leaders who have a game in hand and Gilchrist, who has been a revelation since coming into the team, refuses to look over his shoulder. "We're only looking up," he insisted. "We'll take it game by game. We are a new group and are still gelling and getting to know each other. "The manager said if we want to do well in this league we have to take points away from Dublin so we're starting to do that now." Monday night's first half display against the Saints was as impressive as Declan Devine's troops have been this year as they came out of the blocks flying and Pat's looked shell-shocked. 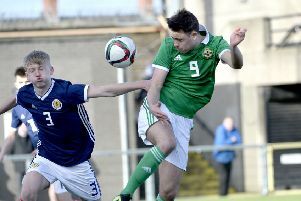 It was all the more impressive given Devine opted to rest Barry McNamee, Ciaran Coll and Gilchrist's central defensive partner, Eoin Toal and the Scotsman believes the performances of their replacements, Gerardo Bruna, Patrick McClean and Josh Kerr showed how strong the squad is. "First half an hour I thought we were excellent. It was probably the best we've played all season. It's a good pitch. We trust all the boys and credit to all the boys who came in tonight, Gerardo and Josh Kerr, did great. "It shows the togetherness in the squad. We all trust each other. We know we're good players and it's just a great feeling to get the win. "Josh is a great professional. He's not had much of a chance this season but he took his chance well this evening. "We train every day together and we're a tight knit group, especially at the back so I'm delighted for Josh who did great. "We need everyone, the manager stresses that. And everyone works hard in training. So credit to all the boys and the management. "It's great to see people scoring. Is there any chance of me scoring though?," he laughed. "I haven't scored yet but I've had a few sitters. I'm definitely due one so we'll wait and see." Perhaps he's saving that for Friday night's visit of the Hoops!